Last week I drove my family back from Florida after spring break. On the way, they watched the movie Hitch. Yes, you heard that correctly. I was driving and my two kids (ages 8 and 10) were watching a movie about a date doctor in New York. Yes, my wife was in the back with them eating chips and Capri Suns and laughing hysterically, having made an exception to her very stringent no PG-13 movie rule. Yes, I understand this is only because she has a huge crush on Will Smith. Yes, it’s a mini-van. Yes, I know I was the sucker on basically every level in this scenario. Can we please move on?! “I yelled at her. I screamed at my boss! I quit my job!” I literally spit my drink out. The kid’s recall on movie quotes is hysterical. It’s particularly funny when he busts out quotes first thing in the morning or when I’m talking to him through the bathroom door. Yes, I realize our relationship is… interesting. This started a back and forth pseudo quote war. While I usually get the gist, it’s amazing how he can recall quotes verbatim in both words and inflection. Later, I was thinking about that line a little bit more. “I’ve waited my whole life to feel miserable.” It got me thinking about conversations I’ve had with a lot of high school seniors over the last month. A LOT. Some of these conversations were in person on campus or in high schools. Others were over the phone or email. A few were kids from my neighborhood and surrounding community who I know personally, while others were in states around the country, and several occurred abroad (it’s been a busy April!). 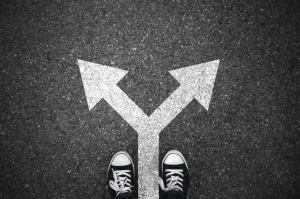 If you are still weighing your college options, I hope I can alleviate some of your uncertainty, stress, and confusion with these quick thoughts. Options and choices can feel overwhelming, but don’t forget that THIS WAS THE GOAL! This decision is not a burden—it is a privilege. It is a blessing. THIS is why you visited schools, researched colleges, and applied to more than just one place. THIS is why you took tough classes, studied, worked hard, and sat through multi-hour standardized tests—to have choices, to have options. You are EXACTLY where you wanted to be! You did this to yourself—and that is a great thing! If you are still weighing your options this week, you don’t have to decide—you get to decide! You get to think about the place you will thrive and create a lifelong network. You get to talk through your options with your family who loves you, are proud of you, and are excited about this next chapter of your life. You get to do this while finishing high school alongside peers who want to excel and teachers who have always wanted you to learn, grow, and succeed. 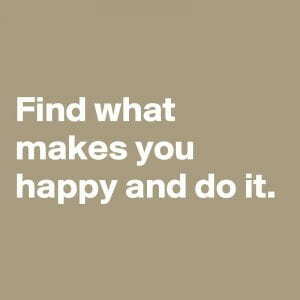 Don’t be uncertain—you get to do this! 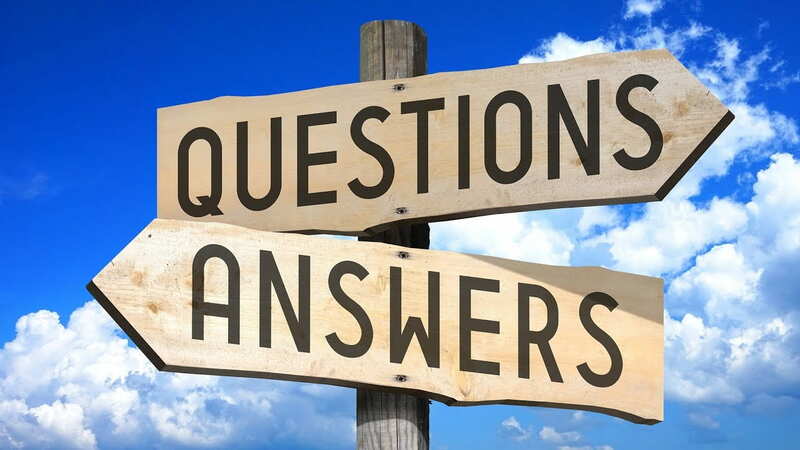 Adam Grant (organizational psychologist/ great follow on Twitter/ Ted Talker/ brilliant dude) said recently, “When people come to you for advice on a decision, resist the urge to give them an answer. People rarely need to hear your conclusion. They benefit from hearing your thought process and your perspective on the relevant criteria for making the choice.” Well, I’ve given you mine over the last few years (see basically all blog entries, specifically Ask GOOD Questions and Ask the Same Questions, Again and Again). Here is the simultaneously beautiful and disconcerting reality (life in a nutshell) – in the end, only you can make this decision. This is a big deal, for sure. But it is not life or death. This is not about being right or wrong. At the risk of sounding trite: you know you. As life goes on, you will continue to find closing other doors is never easy. If no one has told you before, I consider it a privilege to be the one to tell you this is the first of many times you will experience these types of choices: relationships, jobs, graduate school, or moving to a new city, state, or country. Sometimes the hardest part about being talented and wanted, and the most difficult part about having options, is there is not a definitively right answer. Perhaps Steve Jobs said it best in his 2005 Stanford Commencement address, “Your time is limited, so don’t waste it living someone else’s life. Don’t be trapped by dogma — which is living with the results of other people’s thinking. Don’t let the noise of others’ opinions drown out your own inner voice. And most important, have the courage to follow your heart and intuition. They somehow already know what you truly want to become. Everything else is secondary.” Your goal is to be confident in and excited about your college decision. Ultimately, the best advice is to trust your gut. That is not a cop out—it’s the truth. You can do this; you need to do this. YOU got this! In 1519, Hernán Cortés sailed to Veracruz, Mexico upon the direction of the King and Queen of Spain, in order to find gold, silver, and a new place to settle. When they arrived, his crew talked incessantly about returning home. They were thinking about home, family, their known life, other places, and an easier path. As they came ashore, Cortes ordered them to “Burn the ships!” Why? So they could not look back, and instead would be fully committed to the expedition. Once you put down your deposit, that is your job as well. Be all in—buy the t-shirt, put the window decal on the car, start following student groups on social media, donate or trade the shirts you have from other school (don’t go all Cortes here and burn them), close/cancel your applications from other colleges, and start planning on orientation in the summer. Don’t look back. You made the right choice. Embrace it. Enjoy the end of your senior year and a well-earned summer. Too many students second guess themselves and spend their summer in angst. Burn. The. Ships! Final Note: You may find you need to go for a walk, a drive, a run, a treadmill (bear with me), or just sit in the dark as you come to your final choice. To assist our staff put together a “Decision Time” playlist. This is unedited and unfiltered, so enjoy. Good luck! We are excited for you! I had the opportunity to visit Munich, Germany last week. It was a beautiful town. Rich history, amazingly friendly people, and extremely walk-able. I also asked my e-friends, Siri and Google for “Top Things to do in Munich.” In the end, I hit a few of the “must dos” but also picked the experiences and sites that most interested me. However, some of the most enjoyable moments were actually sitting in the train station, eating in the restaurants, and riding the trams downtown, and going into local grocery stores. Granted I only half understood every fifth word (yes, that’s another way to say roughly 10%), but it was still a great way to observe and appreciate the city’s culture and personality. 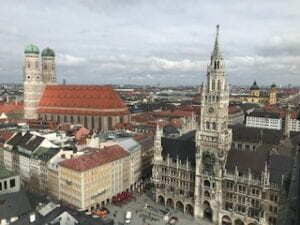 I share this with you partly to talk up Bavaria as a possible future vacation or study abroad destination, but more so because April is one of the heaviest campus visit months of the year— as are the summer months that follow. Every person and site listed the Hofbrauhaus. I get it- remarkable place— and definitely a classic city trademark. But if you were to only go there, you’d miss the real heartbeat of the city. Same thing with campus visits. Yes, you should go to the admission info session and tour. Not for the big brother element of whether they’re going to count it or track it, but because this is where you will get the highlights, hear the key messages, learn some history, understand their unique mission and goals, and see the key iconic buildings and top destinations on campus. View from the top of St. Peter’s (after I caught my breath). Unfortunately, too many people visit campuses and cities the same way. They hit the highlights and follow the crowds or lists. I’m imploring you to break away from the well-traveled path to dig a bit deeper and really feel, see, experience the places students (aka- the locals) spend time. During my three days in Munich I probably covered a good 20 miles on foot just meandering down the river on trails, taking random turns on city streets, or walking to meetings. Yes, I got a little turned around (my wife insists there’s a difference between that and lost), but it was totally worth it because I was able to stumble on stuff I’d otherwise never have seen. And while my German is what you’d politely label “nicht gut,” walking so much led to some pretty interesting and memorable interactions. Here is the good news— people on campus want to answer your questions. They want to help you understand what makes their school so great. Make time to wander around, loiter (in a non- threatening way), talk to students, peak in on a class, eavesdrop (we’ve covered this before as a critical life skill). Listen the conversations around you; observe what students are wearing, discussing, and doing; sit in the student center and pretend to look at your phone or a student newspaper while really glancing about. If you will extend each of your campus visits by just an hour or two and make time for this, you’ll walk away with a much better feel for the place than simply running and gunning from one canned admission talk to the next. I have read a good bit about the 1972 Olympics and really wanted to see that area. It wasn’t what most people listed and it was not as convenient to my hotel, but it was important to me. You’ll be spending time, money, and energy to go see these schools. Make the time to see what specifically interests you- the places you think will make up your experience. Get a feel for those areas of campus. A tour guide may simply point out the business school from 200 yards away, but if that’s going to be your major, you need to get there. The bottom line is you should not simply take what they give you. Own YOUR visit. 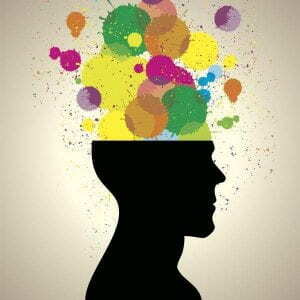 Are you thinking about playing on the rugby or participating in robotics or doing research or singing in the a cappella group (if all of the above, you are a truly unique individual, my friend)? Get over to the IM fields, reach out to a department advisor, or contact out to the club or group’s advisor in advance of your visit. Tour guides are awesome people. They are involved, passionate, and volunteering their time. They are taking you around a place they love, which means they can absolutely wax poetic about campus history or spin yarns about classmates or friends and their adventures in college. They’ll go into lots of detail on history, facts and interesting information, but they also love to hear and answer your questions. 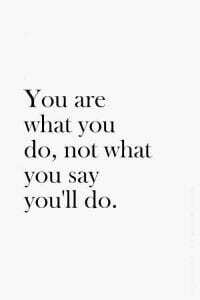 Be proactive and bold enough to ask. Don’t want to interrupt the tour guide or ask publicly? Totally fine. Wait until you’re walking between points or hold your questions until the end and ask privately. Think about it this way- you are making a decision about where to spend the next four or five years of your life (a time span representing a solid 20-25% of your life to this point). If you are serious about applying to or attending that college, you need to hear first- hand from as many people on that campus as possible about the things that matter to you (students, advisors, faculty, admission reps, etc.) Are their answers similar? What can you learn about the college’s culture based on commonalities? Too often we hear students say, “Yea. I didn’t apply there because it was raining on my visit.” Or “I just didn’t like what my tour guide was wearing, so I didn’t apply.” Come on, people! You would not want someone to judge your high school or hometown based on one person they met from there, right? Don’t do that to a college that has 5000 or 50,000 on campus. YES, this means working a little harder. Sorry. That’s college, my friends. What has surprised you or disappointed you about this place? What do you wish were different here? What do most people not realize this college is really good at? What makes this place different (not better) than other schools? How has this school changed or shaped you? What has not been asked today that you think is important for everyone to know? Document, document, document (this is also a good HR lesson, but we’ll save that life advice for another time). Where did we see that library that didn’t have any books? Who was it that said they were adding a program in artificial intelligence? Was that in Illinois or Indiana where we met the kid who held the national jump roping title? Take the time during or right after each visit to write (type, bullet point, take pictures, voice record, etc) down your impressions. More of a spreadsheeter? Go ahead and quantify or rate things that matter to you: academic program, quality of food, campus feel, style of tour guide, surrounding community, access to internships. Just get this stuff recorded in some organized manner, so that you can revisit it later. What impressed you about the students? 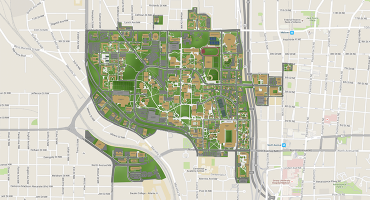 What did you not like about the size or layout of campus? How was the food or coffee? What did the labs look like if you are going to be a bio major? What did they say about internships or co-op opportunities? Yes, I’m jet lagged and spit balling here (a dangerous combo). Again, you need to have your questions answered and focus on the elements of campus that matter to you. Be nice to the people at the front desk when you are checking in for tours. Sometimes this is a student (could be you in a year or two), sometimes this is the admission counselor who will be reading your file (and they have great memories and a powerful note taking CRM at the ready), sometimes this the director of admission just taking her/his shift at the desk. Bottom line- Don’t be jerk. This can also be applied to baristas, hotel clerks, airline gate agents (bear with me), etc. Golden rule, my friends. Embrace it. Have fun and travel safe. Enjoy the adventure! This week we welcome Senior Admission Counselor Samantha Rose Sinclair to the blog. Welcome, Sammy! Everyone has that one thing they struggle with, whether it’s watching YouTube until 1 a.m. (me), drinking enough water (still me…) or picking their socks up off the floor (also me. I regret making this list!). Months ago, as the world crept into 2019 and forged hopefully into tackling New Year’s resolutions, many people’s to do lists were topped with my #1 kryptonite: organization. In elementary school, my mom used to get calls from teachers saying the contents of my desk were spilling, literally, out onto the floor. One time, my third grade teacher paired the class up to go through one another’s backpacks and reorganize the contents in hopes we’d stop losing assignments. Boy, did my partner have a daunting task ahead of him (sorry John). My organizational skills today are no better. My closet is overwhelming—clothes are unfolded, unorganized, and overstuffed. The problem just might be that when given the option on what to keep, I keep all of it. I can’t be the only one who has a second wardrobe of aspirational clothes. After all, you never know when you might need a floor length black sequined dress for a Halloween-themed masquerade ball. It could happen! Luckily, but not coincidentally, a unique organizational method took the world by storm around the start of the New Year. Marie Kondo won our hearts, while Goodwill won the contents of our closets. 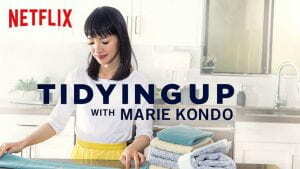 Marie Kondo introduced us to the Konmari method through her Netflix series. Her minimalism-inspired approach encourages people to take stock of what they have, cherish those things that bring joy, and get rid of what does not. What does this have to do with college admission? Good question. Right now, the college search and application processes are wrapping up for high school seniors, which means it’s time for the next class of students to get started! Juniors, right now you’re probably listening to parents and counselors advise you to build a list of colleges to visit over spring and summer break. With over 4,000 colleges and universities in the United States alone, it can be absolutely overwhelming to know where, or how, to start. The Konmari method starts with creating a vision of what you want your life to feel like once you’re done with the process—who are you, and who would you like to be in the future? When you start the college search process, it helps to visualize the end, so let’s work backwards. Where do you imagine yourself after high school? I don’t necessarily mean which college, specifically, but when you close your eyes and see yourself walking across a campus, what do you see? What don’t you see? There are categories that are more obvious in the college search process (big school, small school, urban school, suburban school, and so on) but don’t forget about the smaller stuff. For example, I didn’t know how important trees were to me until I moved to an area of the country that had lots of fields, but not so many trees. It mattered—and it didn’t feel like home to me. Once you have a general vision, your college counselor is an invaluable resource to help you find a few matches. There are also online college search sites to get you started if a counselor isn’t available at your school. Still not sure where to start? Check out our college selection guide, designed to help you find the right match for you. What fits, and what doesn’t? A shirt can be a perfectly good shirt. A sequined dress can be a perfectly good sequined dress. And a college could be a perfectly good college. But if these things don’t suit you or your specific needs, then it’s time to move on. Before even opening up a web browser, the most important thing you can do is be thoughtful about what is most important to you (and your family!). Academic offerings, cost of attendance, distance from home, the list goes on. Choose which matter to you, and how much they matter to you. Only then can you know what fits. A quick note on college rankings: we’ve talked time and time again about where college rankings might (or might not!) fit into the college search process. To sum it up briefly for our purposes here: once you dig a little deeper, there’s a good chance the methodology and values used in the ranking system don’t fit with the things that are most important to you. Rankings might be a good tool to help you discover colleges across the country, but keep the perspective of it being just that: one tool. You don’t have to force fit at a school just because it’s highly ranked. Also, be mindful of schools that might not top a ranking list, but could very well top yours. Keep going beyond the numbers, and keep in mind the things that are genuinely important to you. Here’s the big one! The ultimate goal of the Konmari method is to surround yourself by the things that make you the happiest. A college might look great on paper, your goals might be aligned, but it’s still entirely possible it might not feel right. And that’s okay! Fit is entirely personal. Much of this comes down to finding your place within the larger culture and community, and that isn’t something that can be reduced to a set of statistics in a glossy brochure or a website of major offerings. Does the vision of the institution match your values and interests? Look up the school’s mission statement– what are they about? Look at videos and blogs, projects and organizations… who are the students at that school? It’s a magical thing to interact with a community of students and realize, sometimes for the first time, these are my people. Once you start narrowing down your list and eventually visit campuses, only you will know which campuses you see yourself at, and which you genuinely hope to return to as a student down the road. So while I work on my closet, I wish you all the best as you work on your college search. And if you need a black sequined dress for a masquerade ball, you can now find it among the racks somewhere around Atlanta—I hope it brings you joy.